Hi! Hope your weekend is going great! I'm super excited to show you what's new from Salon Perfect. I've included the press release for you and then I'll let the pictures do the talking :) I received Jolt, Shocked and Zapped to show you. What happens when you mash up two of this summer’s hottest nail trends: neons and matte glitters? You get an energizing burst of color from the new Salon Perfect® Neon Collision nail Salon Perfect® floats neon matte fine glitter in a clear base to create this “can’t-not-look” collection of six eye-catching shades that offer complete coverage in 2-3 coats. Or give nails a blast of nail art by using any Salon Perfect® Neon Collision shade as a one-coat layering polish, or blend two shades to create an easy ombré look. Salon Perfect® Neon Collision will launch in June exclusively at Walmart stores nationwide as part of a limited edition promotional display. Individual shades will retail for $3.98. From lashes and brow products to nail color and beauty tools, Salon Perfect® has the products needed to get effortlessly gorgeous looks at affordable prices. View the complete Salon Perfect® collection at www.salonperfect.com. Tried a gradient. No undies here and no top coat. Just two coats of each shade. You can see it's on the gritty side. Bottle shot of Jolt. The last two photos show the gradient with one coat of Seche Vite. Would probably need two to fully smooth it out. 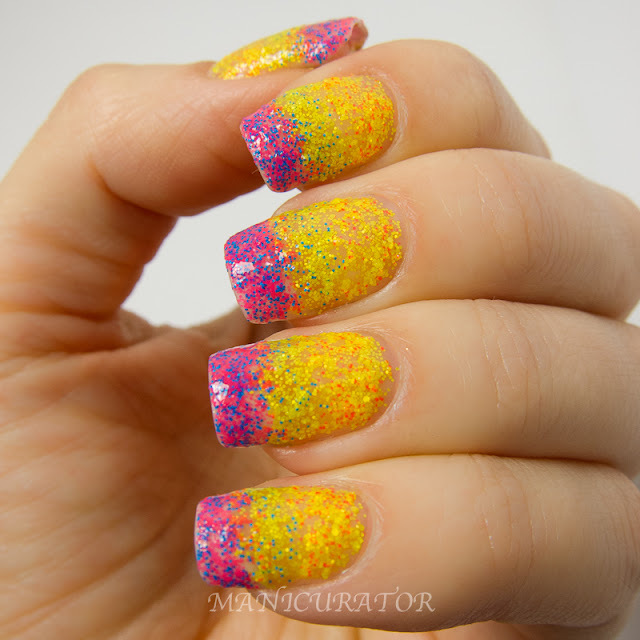 I love these as one coat over a base color and honestly, the gradient looked better in real life, rather than these macro shots. But either way I think it's a fun Summer look that is easy to do! Are you planning on picking up any? If so, keep in mind they are Limited Edition, so scoop em up when you see them! I think I'd be more excited for these if 5 of the 6 didn't contain yellow. Yellow is just not a great color on me. I kind of like Shocked, I may have to keep an eye out. My Walmart's not so great at nail polish. Any idea exactly when these guys hit the shelves?? Hi Angela, they just said "in June". I did hear from one reader that she found them in the store already. Thanks so much for the speedy reply, I'll start looking! Madchester was a fad in the involving rock and belly dance music. Conventional music has for ages been popular and 's been around for many several. Honestly? Big fat yuck here. 1 - egads, enough with that yellow! I don't think it's a good yellow on you via pictures, and I've seen many other yellows that are awesome on you. I can't wear yellow so none for me. 2 - very limited palette. Neon lime, neon blue, neon pink, neon purple all are ignored, yet are more wearable colors. I'm calling Shocked fuschia vs a real bright neon pink. 3 - Nail Pattern Boldness has some similar ideas out in her main line - Seppuku, Don't Drop That Spoon, Le Big Party are the few I can think of. Those appear cleaner, more wearable colors with better glitter coverage. Plus, any other lines out, since most wind up with a Floam knock off. So these are just BTDT, but with better polish. 4 - the texture! 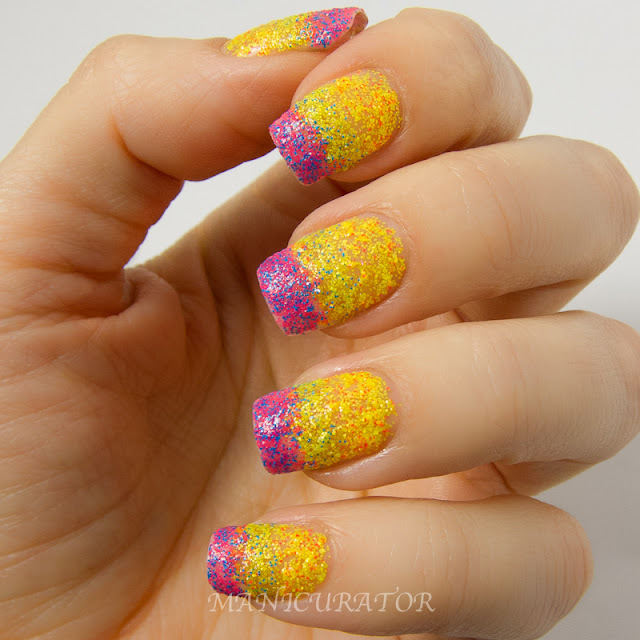 I'm a dirty, rotten picker, but these look way rougher than other neon glitter worshipping polishes. Mine need 1 coat Glitter Food, then whatever top coat. I'm not a fan of SV with the shrinkage issues, but that's me. Just me or does this remind anyone of Floam? snips, etc. For burned in relation to residue, use their cleaner recommended by using the manufacturer. if you don't mind, I'm going to try this mani. Its beautiful.